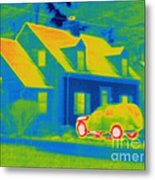 There are no comments for Thermogram Of Car In Front Of A House. Click here to post the first comment. 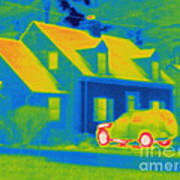 A thermogram of a parked car in front of the house. 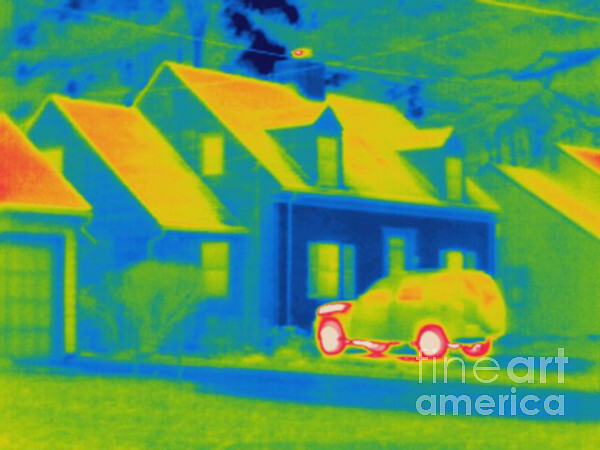 The car is quite hot and must have just arrived. This type of thermal imaging is useful in law enforcement. The temperature range goes from hot (white) to cold (blue). Thermography is a technique for visualizing the temperature of surfaces by recording the emission of long-wavelength infrared radiation. 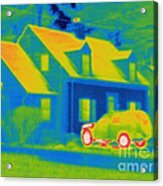 This heat radiation is detected electronically and displayed with different colors representing different temperatures.